.htaccess is a configuration file used on web servers running the Apache Web Server software. The server looks for specifically named files as the first page of your website, also known as the index page. For example, if you were to ask for www.example.com/about/, a typical web server will look for a file called index.html in the about folder of your website. If it exists, the server will deliver that page’s content to the browser. You can change the name of the index file your account looks by using directoryindex rule in your .htaccess file. First thing you will need to do is locate or create the .htaccess file. This can be easily achieved using the File Managers located in your hosting control panel or by using a FTP client such as FileZilla. In this tutorial, we will use Hostinger’s File Manager. 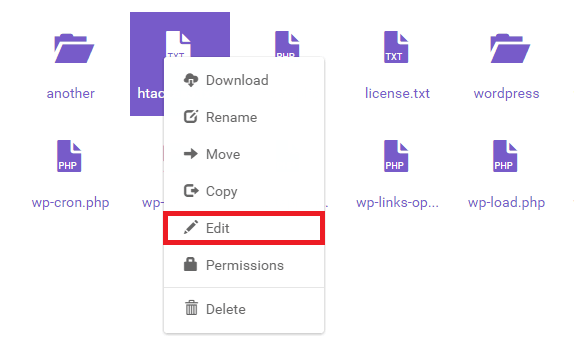 If .htaccess does not exist, you can quickly create it by right-clicking on an empty area inside File Manager and selecting the New File function. After that, you will be prompted with a file creation box, where you will need to enter the new file’s name. In this case, you will need to type .htaccess and press Create to save the file. Once that is done, you will be able to edit the newly file and add your code. You can also list more than one file in the configuration. Your specified index files will be read and checked from left to right. In this example, we add index.htm, index.html, and index.php to the list. First, the server will check for first.html, if it does not find a file with that name, it continues to index.htm and so on. When using this configuration, the browser will first look for index.php. In case it may not be accessed, the next file to load would be page-down.php. Once the desired code is added, don’t forget to Save the changes and the configuration will start taking effect. Congratulations! You have successfully changed the default index page of your website by manipulating the .htaccess file. In this tutorial, we have learned how to effectively change the first page on your website using .htaccess. We’ve also learned a few practical tricks that can benefit every developer at some point in time. In case you have any cool tips that you want to share with us, you are welcome to do so in the comments.